As many of you may have noticed, with the introduction of personal Avatars and personal Buffs we have removed the job of Avatar Warden. This decision does not come lightly as we know ranks are important to a lot of people. We have demoted almost all Admins to their respective XP Brackets, they are entitled to any title they would like including Legendary Member title which makes them unkickable due to inactivity as a thanks for their service. We have kept a few that we thought may deserve a shot at becoming a member of the team. Our new structure has Administrator rank as the first step into the team as a trial role. This rank now has full access to all admin abilities, forums, and discord other than Kick Rank powers. They are either promoted or Demoted after a set period of time based on how they contribute as a team member. We have also taken the opportunity to change a lot of the ranks within the Team. You will notice a lot of org+ have had their ranks changed to better fit their current contributions to the clan. Congratulations to those that were promoted! I hope you understand all of these decisions came with a lot of discussion and we hope you understand its for the best for the future of Overloaded XP. Any questions can be directed to Kirt, Wilt, or myself. 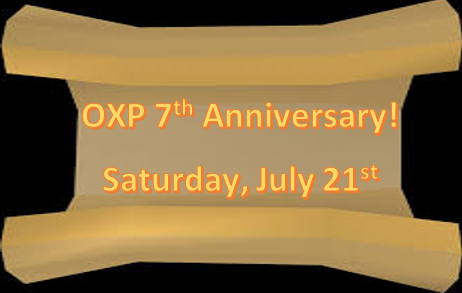 Overloaded XP was created on July 21st 2011, therefore we are having our 7th Clan Anniversary On Saturday, July 21st! Our clan has been through a lot in the last 7 years, and we owe it to all of the hard work and dedication so many of our past clanmates have put in to making OXP a perpetually strong clan for years to come! So, let's celebrate! Everyone is invited to come to any of the following events! We will be having multiple Boss masses, fun events, and we are giving away over 500m! All times are in EST CLICK HERE for a Time Zone converter. Overloaded XP's Newest Deputy Owner! I have decided to award Wilt as our Newest Deputy owner of the clan! Wilt has been a constant presence in this clans leadership for a long time now. Always having his eyes set on improving our clan in every way possible, speaking his mind openly, and acting as a leader of this clan should. He has proven time and time again how valuable he is to the clan and to myself as a fellow leader. I hope you all will join me in congratulating him on this new prestigious rank and continue to treat him with the same respect and admiration that you all have shown me as a leader of this clan.